You will also need skewers for the meat, you can griddle or use a BBQ. If you are using wooden skewers, remember to soak these in water fir 30 minutes before you use them, this stops them catching fire and burning. Slice the large meat items into thin strips, and butterfly the prawns (slice the fat part of the tail in half, but only halfway along the prawn- this means they cook more evenly) but you still thread them onto a skewer). 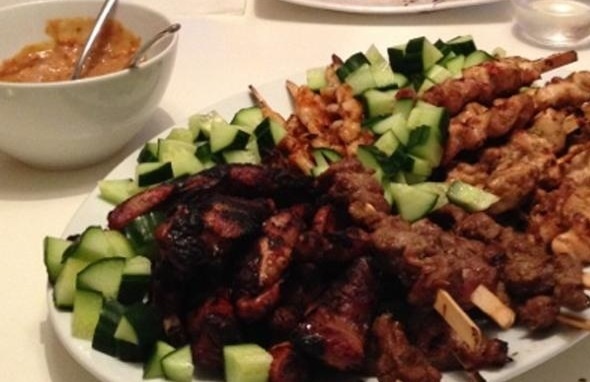 Place the meat items and prawns into their own dishes, and divide the marinade between them. Ideally marinade in the fridge for 5-6 hours, but at a push, 2 hours will also work.